It was a big week for Doctor Who news in the wake of the Season Three finale on the BBC this past weekend. Some of the major revelations include the Doctor’s most recent companion Martha Jones taking a break from the TARDIS, and Catherine Tate (who appeared in the 2006 Christmas special) signing on as the Doctor’s new companion Donna Noble for all of Season Four. From there the show will settle into a regular Friday-night slot on the Sci-Fi Channel, running through the end of September with a week off for Labor Day. They’ll be airing the final two episodes, “The Sound of Drums” and “Last of the Time Lords,” back to back, which is thoughtful of them. Freema Agyeman, 28, who was rumoured to be facing the axe from the BBC One revival, will in fact only be absent from the first half of the fourth series. … Agyeman will guest star in three episodes of Torchwood, the sci-fi spin-off on BBC Two, before returning to Doctor Who as sidekick Martha Jones. The BBC says that Martha’s stint on Torchwood will “expand” her character, and if nothing else it will establish her among the few characters who can cross back and forth between the different shows within the current Doctor Whoniverse, like Captain Jack and Sarah Jane. 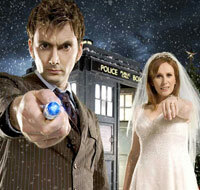 And while Martha Jones is away, Catherine Tate’s character Donna Noble will be taking over as Season Four’s main companion. We last saw Donna at the end of “The Runaway Bride,” standing outside the TARDIS and declining the Doctor’s offer to climb aboard for some further adventures â€” but apparently Donna will be having a change of heart about that. [Tate] will join David Tennant for the complete 13-week run of the new series of Doctor Who, which is due to begin filming in Cardiff later this month. Tate will be returning to her role as Donna, the runaway bride who found herself transported into the Tardis as she prepared for her wedding on Christmas Eve. … Doctor Who’s executive producer and head writer, Russell T Davies described Tate as an “absolute star” in The Runaway Bride episode. Finally, according to Outpost Gallifrey, the attempt to show the season finale at London Pride (which I posted about previously) turned into a major disappointment for gay Whovians. Who fans who endured very wet weather in London yesterday were disappointed when the organisers of London Pride 2007 had to pull the plug on the season finale … Hundreds of people gathered in Trafalgar Square to celebrate gay pride and were looking forward to seeing the show on the big screen when, at approximately 7.45pm, an apologetic host told the crowd that the programme had been cancelled. It was initially blamed on a faulty DVD player, but later transpired there was an 8pm curfew imposed on the event by Westminster Council and the police which meant there was no time for the broadcast … Altogether, a wet and disappointing day out in London for Who fans. Ah, well. At least they have Kylie to look forward to.